Start your Berkeley experience with a global perspective. UC Berkeley invites you to register for Global Edge, an exciting program for newly admitted Berkeley freshmen. Start your college experience in an extraordinary way — spend your summer at Berkeley then your fall semester abroad in London! Begin your undergraduate studies at UC Berkeley in the summer with orientation, pre-departure activities, and courses. 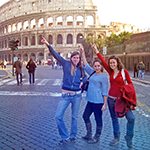 After the Summer Session, you travel abroad and spend fall semester taking Berkeley courses. After the program is over, you return to the United States for spring semester at Berkeley.